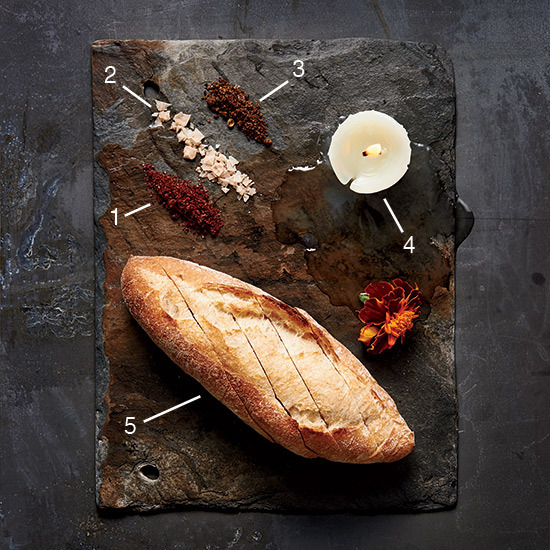 At Cleveland’s Trentina, the bread course is like an interactive performance piece. Its focus: a candle that emits a mysteriously beefy scent. Trentina chef Jonathon Sawyer turns his restaurant’s bread course into a dramatic, almost magical experience. As guests sit down to one of the tasting menus, a waiter lights a small candle on the table that emits a savory aroma. Just as the melting candle threatens to overflow changed from “tablecloth” because there are no tablecloths at Trentina. The tables are mirrored, a server announces the bread course: semolina baguette and edible beef-tallow candle. Sawyer infuses rendered beef fat with rosemary, sage and thyme before molding it around a wick. Spreading animal fat on bread is an old practice, he explains; beef tallow was used in 18th-century England to moisten stale loaves. “And of course,” he says, “we can’t pretend to be the inventor of the candle.” 1903 Ford Dr.; restauranttrentina.com.